The most important efforts of the Destin Woman's Club go towards fundraising. The Mistletoe Ball was our initial fundraising event. Today's efforts have evolved into several events per year. The proceeds from these events have been donated to support: Destin Elementary, Destin Library, Emerald Coast Children's Advocacy Center, Shelter House, Sacred Heart Hospital of the Emerald Coast, Inc., the YMCA, and Sacred Heart Women's Diagnostic and Wellness Center and Birthing Center, Children in Crisis, Inc., Destin Fisherman's Fund, Caring & Sharing of South Walton, Inc., Destin Woman's Club Assistance Fund, and Fisher House of the Emerald Coast, Inc. Additionally, we support a self perpetuating scholarship fund at Northwest Florida State College for qualifying local women who strive to re-enter today's competitive workforce. Fisher House of the Emerald Coast, Inc. 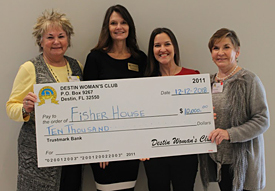 The Destin Woman's Club continues their support of the Fisher House on the Emerald Coast, Inc. Since 2007, the DWC has raised over $15,000.00 in proceeds for the Fisher House of the Emerald Coast, Inc., which provides housing facilities for injured soldiers and their family while they are going through the rehabilitation process. This is a non-profit organization and not funded by the military. Visit their website. Our helping hand does not end here. The Destin Woman's Club also has the DWC Assistance Fund, which tries to help fill the gap between public assistance and self sufficiency. We strive to give help in such a way that those in need may further help themselves. The Destin Woman's Club Assistance Fund, formally known as the Mary Kirkpatrick Assistance Fund, serves to aid and assist the needy in our area. This fund seeks to fill the gap between public assistance and self-sufficiency and strives to help in such a way that those in need may further help themselves. Click here for detailed overview and DWC contacts. 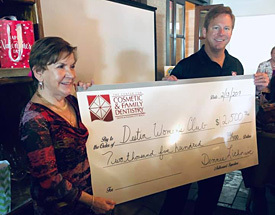 On February 13, 2019, Dr. Dennis Lichorwic of The Center for Cosmetic and Family Dentistry renewed his Platinum Sponsorship with the DWC by presenting the membership with a check for $2,500. On August 1st, 2018, Ron Moliterno, President of Community Affairs and Linette Wager Community Bank President BanCorp South Bank, a Gold Sponsor presented a donation of $500.00 to the Destin Woman's club. This donation will help our Fundraising for Fisher House on the Emerald Coast and the Destin Woman's Club Mary Kilpatrick Assistance Fund. (Photo Above) Check presentation to the Fisher House from the 2018 Glitz and Glamour Fashion Show monies. Pictured left to right Linda Hodges (Vice President), Mia Hughes, Carolyn Espinoza and Kate Callicotte (President). Thank you to our members and friends for participating in the Breast Cancer Walk Donation. We were able to raise $412.00 through the lipstick/pouch combos and sunglasses sales. Thank you to our organizer and Avon Representative, Betsy Stout-Jones. That is a lot of $10 lipstick/pouch combos and $15 sunglasses. 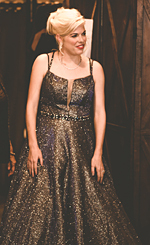 The Destin Woman's Club held its Annual Fashion Show on Friday, November 2nd. The luncheon and fashion show is the largest fundraiser the Destin Woman's Club does each year and this year was bigger and better than years past. The Louisiana Lagniappe, with its beautiful view of the harbor was the perfect backdrop for this festive event and was all abuzz with the sights and sounds of a true celebration. The tables were adorned with wonderful decorations of Top Hats and oversized Martini Glasses accessorized with white gloves and pearls. The ever-popular Wine and Celebration Carts as well as the Silent Auction Tables were busy with guests buying tickets and placing bids. This year, local Artist Cindi Eastman, painted and donated a piece of her artwork that was used in all DWC advertising pieces as well as offered in the Silent Auction. Current and past recipients of DWC fundraising participated in this year's event. Volunteers from Children In Crisis, Harvest House, Sacred Heart of The Emerald Coast, Children's Volunteer Health Network, Give Kids a Smile, and Fisher House as well as community representatives modeled some of the exquisite fashions from SOHO, Kiki Risa, Boca, Simply Elegant, Chico's, Brooks Brothers, and Jos. A Bank. The monies raised from the Glitz and Glamour Fashion will go to the Fisher House of the Emerald Coast and the Destin Woman's Club Assistance Fund, which serves to aid and assist the needy in our area. This fund seeks to fill the gap between public assistance and self-sufficiency and strives to help in such a way that those in need may further help themselves. This event could not take place without the generous support of the clubs many sponsors such as Destin Center for Cosmetic and Family Dentistry, Coastal Skin Surgery and Dermatology, Taylor By the Sea Hair Salon, and Bancorp South. 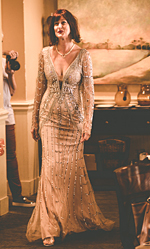 Enjoy this short video of the Destin Women's Club Fashion Show, thank you to All Things Media for the videography and production of this video. The recent Destin Womans Club meeting photos are available on our Facebook page, click here. Below are photo archives from past Destin Womans Club meetings and events. Copyright © 2006-2018 Destin Woman's Club. All rights reserved Site by VTD, Inc.